I started today’s painting at the same time as yesterday’s (Untitled I – July 16, 2017), using the same devices, i.e., positive- and negative-space lines* and free-form design. Instead of creating color fields and forming lines by abutting one color against another, I used brush strokes on today’s composition. The strokes were mostly independent of the free-form pencil lines lying underneath. I inked the right-hand edge of most of the lined the white traces uncovered by masking material and painted a gradient of dark to light in the direction away from the edge. This had the effect of pushing the white lines forward and at the same time, anchoring them to the background. Yesterday’s white traces seemed to be floating above the rest of the composition. Today’s design is much more integrated. 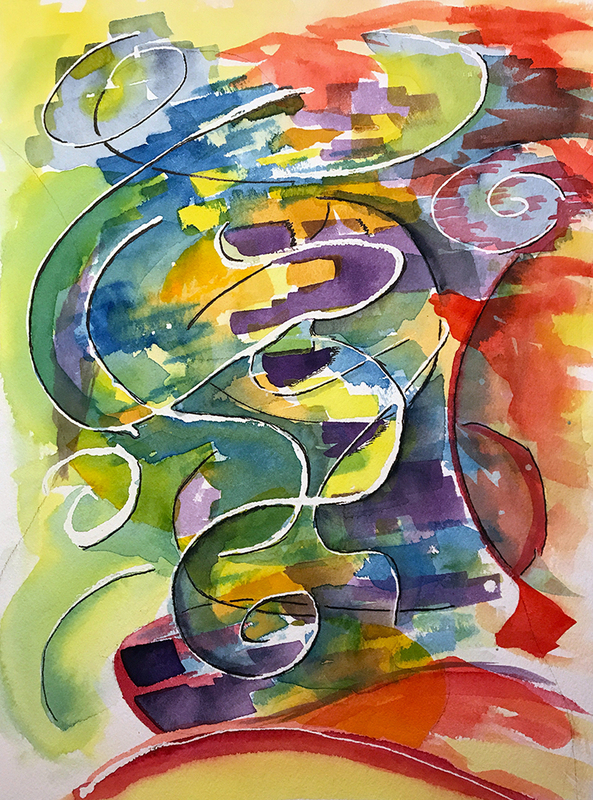 This entry was posted in Personal Stories and tagged abstract art, artistic process, creative process, free form, lines, negative space, painting, sketching, visual arts, watercolor. Bookmark the permalink.